The first and Last Stop for all Your Real Estate Needs! Need help finding the perfect home? Want to sell your home? This process can seem overwhelming, but with the HFCU HomeAdvantage® real estate agent network, buying and selling a home is easy, convenient, and members can earn HomeAdvantage® Cash Rewards*. Members who close their real estate transaction with the HomeAdvantage® real estate network receive HomeAdvantage® Cash Rewards* at closing. Choose from a list of qualified, trusted, and experienced real estate agents in your area. HFCU is ready to get you off to a great start in buying and selling your home! So, you found the perfect house! HFCU’s dedicated Real Estate Team will get you the best finance rate, make the home buying process easy and convenient and get your family into your new home as quickly as possible. Let HFCU Real Estate help you get into your first home, forever home, or anything in between! You can also stop by your nearest branch, or call us toll-free at 1-866-OUR-HFCU to apply today! Want a larger bathroom? Need to add a Mother-in-law suite to your home? Want surgery that isn’t covered by medical insurance? HFCU has the perfect Home Equity loan for you! HFCU Home Equity loan proceeds can be used for anything from a swimming pool to dental implants, and NOW is a great time to apply. With our low rate home equity loan, we can help you have the lifestyle you want! Hurry! These low rates are only offered April 1, 2019 through April 30, 2019. Apply for your home equity loan today! Call us toll-free at 1-866-OUR-HFCU to Apply Today! 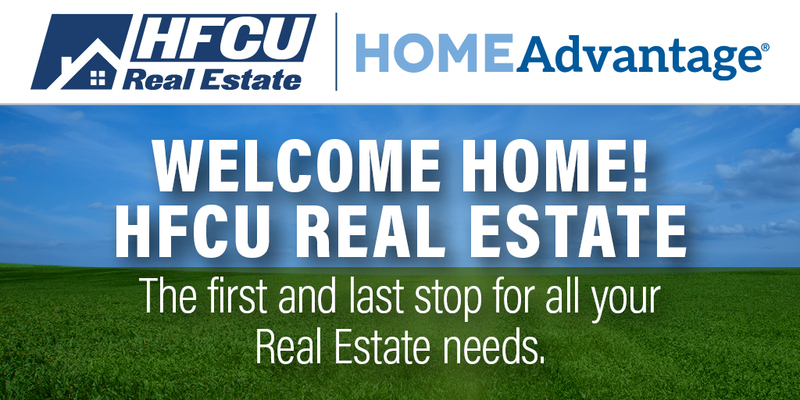 *The HomeAdvantage® program is made available to HFCU members through a relationship between Houston FCU and CU Realty Services. Cash Rewards are awarded by CU Realty Services through the HomeAdvantage program to buyers and sellers who select and use a real estate agent in the HomeAdvantage network. Home buyers or sellers are not eligible for Cash Rewards if they use an agent outside this network. Cash Rewards amounts are dependent on the commissions paid to the HomeAdvantage network agent. Obtaining a mortgage or use of any specific lending institutions is not a requirement to earn Cash Rewards. If you are obtaining a mortgage, your lender may have specific rules on how Cash Rewards can be paid out. Cash Rewards are available in most states; however, are void where prohibited by law or by the lender. Please consult with your lender for details that may affect you. **The credit union will pay normal closing costs which include the following fees: title search, recording fee, release of lien, flood determination, and credit report. Additional fees, such as any necessary title insurance, appraisal, survey, and attorney fees will be the responsibility of the member. This is not limited to promotional periods. Normal credit criteria apply. Rates for approved loans are based on the applicant’s credit history. Loan term, loan to value (LTV), and/or down payment, for example, may vary based upon your credit history. Other restrictions may apply and rates are subject to change without notice. Stated “rates as low as” apply to 1st liens only. Texas residents: The principal loan amount at the time the loan is made must not exceed an amount that, when added to the principal balances of all other enforceable liens against you home, is more than 80% of the fair market value of your home. Texas residents may only have one home equity loan or HELOC in a 12-month period. MINIMUM PAYMENT EXAMPLE: If you financed $10,000 for 5 years at 4.15% annual percentage rate, your approximate monthly payment would be $184.84 for 59 payments with the approximate final payment of $185.05. South Carolina residents: The mortgage amount may not exceed the lesser of 90% of the taxed assessed value or 80% of a certified appraisal. South Carolina residents are limited to establishing one home equity loan or home equity line of credit at one time. MINIMUM PAYMENT EXAMPLE: If you financed $10,000 for 5 years at 4.85% annual percentage rate, your approximate monthly payment would be $188.03 for 59 payments with the approximate final payment of $187.79.